I received complementary tickets to the Harlem Globetrotters game from USFG in order to facilitate my review. As always, any thoughts, feelings and opinions shared are my own. 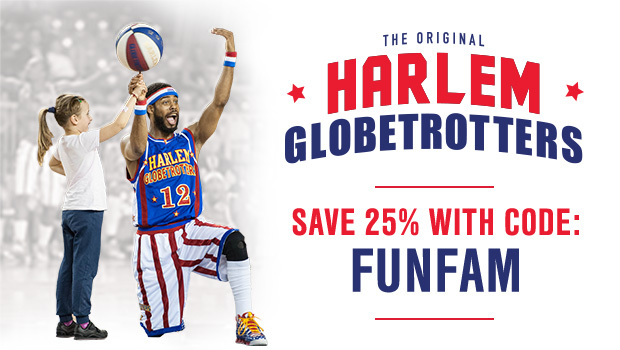 If you're looking for a fun night out, I've got a great event for you - The Harlem Globetrotters 2017 World Tour. It had been years since the last time that I had seen the Harlem Globetrotters but I still remember watching in amazement and couldn't wait to see them once again. Although the players have changed, the fun and excitement of the evening remains the same. It's a basketball game and so much more. As I mentioned earlier, the players have changed over the years (roster) and I was happy to see a female on the team. We got to watch Ace demonstrate her amazing dribbling skills as the announcer emphasized the importance of "girl power"
Know what's even better than looking at my pictures from the Harlem Globtrotters game? Attending a game yourself. So order your tickets online today and use promo code FUNFAM to save 25% off your tickets.